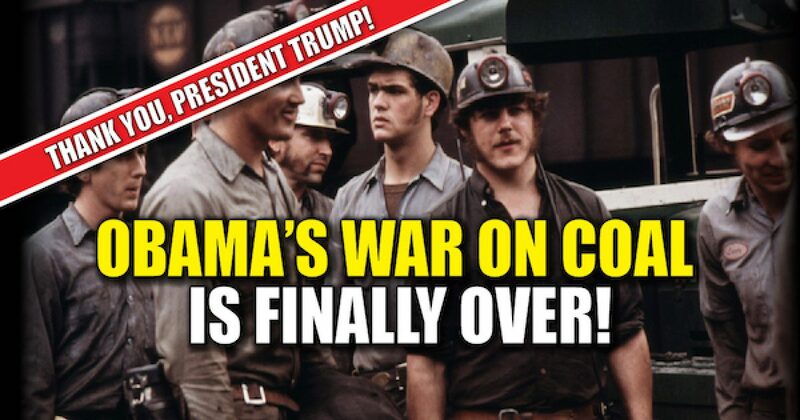 Yes, the war on coal is over, America Won. Of course, liberal politicians and the mainstream media (that’s redundant isn’t it?) will call it a blatantly anti-environment move, the truth is that the announcement is another pro-Jobs move by President Trump that will especially help minority communities. The Clean Power Plan was the centerpiece of Obama’s Climate Action Plan. It was announced in June 2013 and complied with his Paris climate deal pledge that the U.S. would cut its carbon emissions by as much as 28 percent off of 2005 levels by 2025. In anticipation of the plan which places heavy restrictions on coal-burning power plants being implemented (it was placed on hold by the Supreme Court in 2016), the coal industry became even more depressed than the initial Obama anti-coal efforts, but it would affect much more than the coal economy. The plan is a disaster on so many levels, the most important of which is that it will kill jobs from all industries, as US economy will find it hard recover from these regulations. The Obama rule was looking to replace cheap energy with more expensive alternate energy. In other words, it not only raises the cost of energy for the individual households, but also the cost of goods for companies creating and marketing products resulting in higher costs for just about everything…including staple goods. If implemented the Obama program will generate a rise in the price of energy, leading to a rise in the price of consumer goods, that will place the heaviest burden on middle and lower economic class families. And that doesn’t take into account that the rule deals another Obama blow against business resulting in more unemployment, higher government costs, and energy price inflation. Another study, this one commissioned by the National Black Chamber of Commerce and published in June 2015 predicts the Clean Power Plan will leave minority communities with disproportionately fewer jobs, lower incomes and higher poverty than whites. If these regulations were initially proposed by a Republican rather than an African-American President of the Democratic Party, there would be screams of racism, but since the Clean Power Plan was proposed by Barack Obama, those voices were silent. The cost to families in higher energy costs and loss of jobs was not important to the Obama EPA, supporters of the climate change hypothesis or most people in the mainstream media, and is still not a concern.They are so caught up in their unproven hypothesis, they ignore the facts like the fact the Earth hasn’t warmed in over eighteen years. The real purpose of their climate scheme is a redistribution of income worldwide. Thankfully President Trump will not allow it to happen.